Powders and dusts from e-waste recycling processes are a valuable source for different metals like copper or precious metals such as silver and gold. Hence, the recycling of this fine fraction is of great interest. In addition to these precious metals, large amounts of organic, ceramic, and oxidic elements emerge, which have a tremendous influence on slag properties and the entire melting process. In order to recycle the valuable metals and use the energy of the material accompanying the organic constituents, the IME Institute of RWTH Aachen University is conducting research on the metallurgical effects of these fractions when introduced into a molten slag bath and developing solutions to recycle the component metals. Within this research, the influences on the slag phase are simulated using the thermochemical software FactSage™, and the material-specific oxygen amount required to combust the organic constituents is calculated. The results are tested and optimized in preliminary laboratory-scale experiments and later scaled up to technical size. 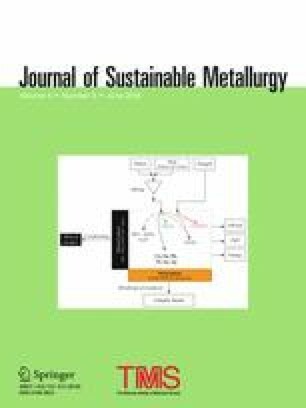 The experimental results show a possible reduction in the slag phase’s liquidus temperature by adding different additives and the feasibility of autothermal melting of fine fractions with good metal recovery rates and low metal distribution to the mineral phase. The contributing editor for this article was Hiromichi Takebe. We offer our special thanks to the Stein Injection Technology GmbH for providing the injection equipment and the knowhow. This project is promoted by the federal Ministry for Economy and Energy according to a decision of the German federal parliament.